First-hand knowledge that widespread newspaper claims (like this one) that crowd-control and logistics for the enormous inaugural event went "smoothly" or "well" were incomplete, to say the least. As I mentioned yesterday, people headed for the vast "no ticket" zones on much of the Mall got in with relatively little trouble (and no security checks, which made sense given how far away they/we were from the Capitol itself). But getting out was a different matter -- and could have been quite dangerous were it not for the good humor and cooperation of nearly everyone in the crowd. People in my zone pushed by the thousands toward what they thought would be exits but in fact were absolute dead-ends, closed off by newly-erected cyclone fences guarded by police and National Guardsmen on the other side. I was taller than most people in the crowd so could generally see around me rather than having that terrifying feeling of blind drift. But I did have the unhappy feeling of being carried along by simple crowd movement in directions I didn't intend. 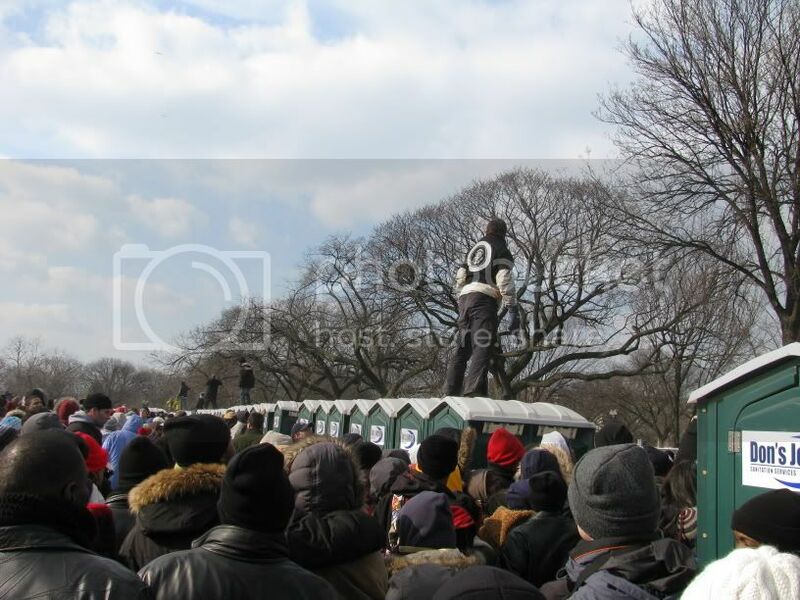 As reported yesterday, people like the one below, who climbed into trees or atop Porta-Potties to see where the exits were, eased what could have been a nasty situation. Bear in mind that there were limitless thousands of people behind me as I took this shot, all pushing forward toward what no one realized was a fenced-off barrier. The guy on the Porta-Potty is discovering that there's no way out in the direction people are heading. He and others turned and started shouting that to people -- and the tide moved, eventually, off to the left. So: it was a great and historic occasion; a very strong speech, as I'll eventually elaborate; a reverent and caring and fellow-citizens feeling among the throngs; and all of that. But flawlessly planned and handled it was not. The Obama campaign appears to have been a marvel of foresight and organization. So, on the whole, has the transition been. Let's hope that the Obama Administration is more like its campaign than like its inaugural day.